The idea of owning a Labradoodle puppy may be a pleasing proposition, but have you thought long and hard about why you want to bring a puppy home? Do you have a specific motive, or a number of reasons for wanting a puppy, or do you have no reason at all? Are you ready for long-term responsibility and commitment? A Labradoodle puppy is only a puppy for a few months until it becomes a full grown dog. If you only buy a dog because you think it’s cute as a puppy, you likely haven’t’ considered that the average Labradoodle lives to be 15 years of age. Are you willing to commit 15 years or more to a dog? Furthermore, behind their cute exterior, all puppies are hard work. They need to be trained and properly socialized. Puppies are mischievous and will get into anything if given the chance. You need patience and need to spend plenty of time teaching and nurturing your pooch to develop into a well-behaved canine. Are you buying a dog to make money off of breeding? 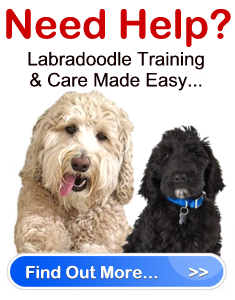 Sure Labradoodles are a popular breed, but do you have the time, resources and money to start your own reputable breeding business? Reputable breeders put a lot of hard work into maintaining the health of a breed, and are often in it more for the preservation of the breed than the actual money making factor. Are you buying the dog for your children? Most children want a dog, and a Labradoodle puppy can certainly grow into the perfect family pet, and is well known for their fondness of children. However, let’s be realistic. Who do you think will be taking care of the dog? You will! If you don’t have the time or energy to take on such a task, consider getting your children a pet rodent. Are you buying a dog for protection? First of all, Labradoodle dogs are not guard dogs and cannot trained to be so. They may alert you at the approach of strangers, but they certainly won’t protect you from them. A Labradoodle is likely to greet robbers with a wagging tail and slobbery kisses, rather than a fierce growl. Secondly, no dog is a tool and should never be used as one. A dog used for guarding needs effective training, but also requires love, affection and proper socialization so it doesn’t become overprotective and attack strangers for no good reason. Do you want a dog so you can feel loved? It’s true that the love a dog has for their owner runs deep. A Labradoodle puppy will always want to be in your company, and will want to please you from the moment he enters your home until the day he/she departs this earth. However, the love and companionship you long for from a dog must be reciprocated. A dog’s purpose in life is not to fulfill your emotional needs. They require care, attention, guidance and grooming in order to be healthy and happy pets. In essence, the more love you show your dog, the more you will receive in return. Do you have a busy life? Do you work all day and go out frequently? How often would the dog be alone? Labradoodles, and all dogs for that matter, are incredibly social creatures. Dogs are pack animals and never travel alone. If you cannot include your pet in most of your daily activities, this is unfair to the dog. There is nothing wrong with having selfish reasons for wanting a Labradoodle puppy, as long as you are fully aware of what it takes to raise and care for a dog. If you are willing to accept the commitment and ready to make a dog a true member of your family, it’s time to think seriously about adopting a Labradoodle as a pet.